Another weekend has come and gone - how do they do that so quickly?! Anyway, house is clean, washing is done, brownies are made (and mostly eaten), my week is organised and I am ready for another Monday. I updated another one of my packs over the weekend. 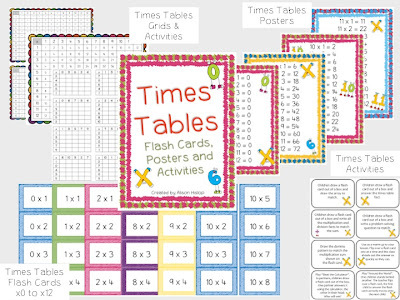 I took the idea of my Times Tables Flash Cards and totally changed the whole pack. If you have previously downloaded it, please download it again - it is triple the size and soooooo much better now! 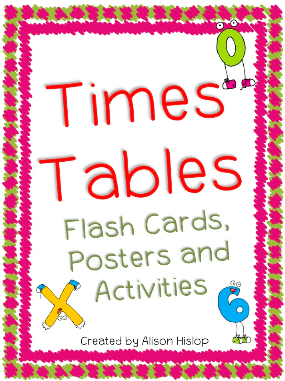 For only $3 you get 48 pages of flash cards, posters and activities. I also made up a little pack using my Australian Map Clipart set. Put Australia Back Together is a cut and paste activity. 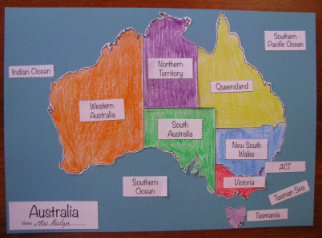 Print the Australian States and put back together, then stick on the labels. As easy as printing and copying! There are two different sizes of maps, perfect for individual and small group maps. Visit my Teachers Pay Teachers and Teachers Marketplace stores for more details on how you can download these packs. GIVEAWAY! Would you like either of these packs? Pick and pack and enter the rafflecopter below! Hurry, you don't have long! These packets look amazing. I wish I had your Austraila packet last year when my history was a trip around the world. I wanted to let you know the Rafflecopter is not working. I love the Australian clipart. I couldn't get the Rafflecopter to work either. Hi Ladies, Thanks so much for letting me know - I hope I have fixed it! I would love the multiplication packet! They both look amazing! I would love the multiplication pack! I just love your 'put Australia back together'! :) I would've never thought of that and how fun.